This winter, with the temperatures so low here in the Ocean City, MD area, the bays behind Assateague Island, canals and inshore water ways have the tendency to freeze over. Many people love to take this opportunity to play and explore on the ice but it's vital to never let your guard down. Ice is a clear and present risk and NO ICE IS SAFE ICE. Doesn't matter if the ice is 2 inches or 4 feet thick, it's always changing with the wind, currents and temperature. During my time in the Coast Guard, I was certified as an Ice Rescue Instructor in Sault Sainte Marie, MI and wanted to give you some pointers and guidelines if you do decide to check out one of nature's most hazardous environments. The Coast Guard has a guideline for ice that is based on thickness. Ice is often weak near structures in the water like a mooring pole or bulkhead. Also a channel that has a constant flow of underwater current may pose a serious threat so it's best avoid these areas. We all know that water freezes at 32 degrees but many don't know that salt water freezes at 28 degrees. 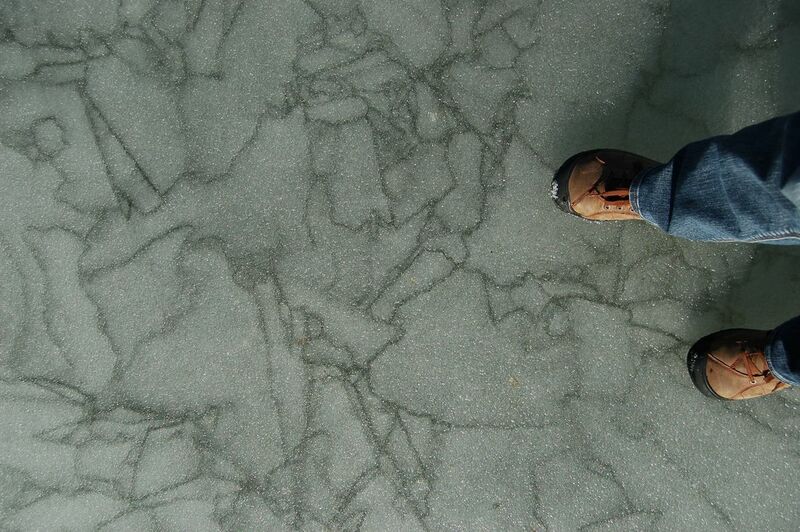 If you're walking on snow covered ice and start to see water cracks or snow melting spots, that's a serious sign of ice failure and you would want to turn back around immediately. While walking with a friend or group it's always best to walk about 10 feet apart from one another which makes the best practice for distributing the weight. If you find yourself on weak ice (lots of wet spots, visual and audible cracks) you would want to get down on all fours or on your stomach and crawl your way back from where you came; never continue your route if you experience these conditions. Be safe out there this winter and never go out on the ice alone. Captain Danny McDorman of the OC Swim Call in Ocean City, MD is a local native and Coast Guard veteran.